After a long night enjoying amazing French wine and a bizarre argument over whether Pamela Anderson or Dolly Parton best exemplified the Divine Feminine in our time our gang of classic American Templar and wine enthusiasts left Chartres cathedral way too early that morning. Before we rolled our bus’ GPS pinged a satellite. We locked on like a guided missile to Domme, a ‘lost’ village in the Dordogne valley no one on the bus had ever heard of but me. Even the satellite appeared to work to locate it. “You wanna go where?” It seemed to say. I was inspired to visit Domme by Ean and Deike Begg. In their book In Search of the Holy Grail and the Precious Blood, they describe the bizarre graffiti found in the chateau at Domme, where Knights Templar were imprisoned during the surprise attack by the Catholic Church in 1307. Here is found a depiction of Jesus’ execution that is slightly twisted from the official Church version. On Jesus’ left is a pregnant woman holding a wand or a rod. Unfortunately, the Begg’s book didn’t include a photograph of this graffiti. I had been dying to see it for years. I’ve written about the perplexing images of a shorthaired, beardless Jesus using a magic rod or wand to perform miracles in several of my books, including Cloak of the Illuminati. For example, in the 5th century portrayal shown here Jesus is turning water into wine with a magic wand at the wedding at Cana. A woman, possibly Mary Magdalene, stands beside him. It was Hebrew custom in Jesus’ time that the groom provided the wine at wedding feasts. Many believe this was Jesus’ wedding to Mary Magdalene. 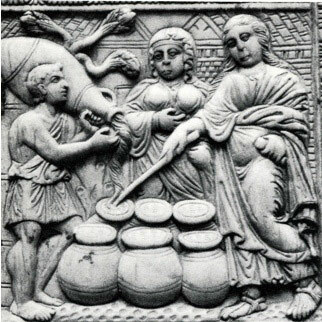 Early Christian art suggests he produced the wine by magical means. Jesus turns water into wine with his magic wand. Is this artist using the wand to rewrite our understanding of Jesus or he is providing an accurate portrayal? If this woman at Domme is Mary Magdalene, as I presumed, the wand likely belonged to Jesus. It would suggest that Mary Magdalene brought his technology to France with her after her husband’s demise. On a hot day in July 2005 I had an opportunity to hunt for it. Rolling through the hilly French countryside I daydreamed about Pamela Anderson, excuse me, Jesus’ wand while looking at fields burned an early shade of brown from the hot summer Sun. I hoped I wasn’t wasting the time of the eighteen revelers who accompanied me to France. The stop at Domme that morning was a surprise to the group. So too was the fact that our bus suddenly overheated forcing us to pull off the road to give it a rest. 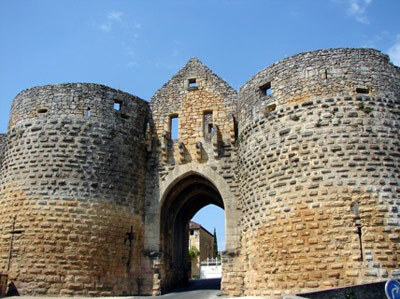 What do you do when there’s nothing to do in France? Whine? No! Find wine! Back on the road, a few anxious hours later we exited the auto route at Domme. My wilting excitement blossomed. A few fellow travelers commented how I lit up every time we caught the light of certain sites. I thought of my cat, Boo, who loves to chase the red beam of my laser pointer dancing across a wall. I think he knows he’ll never catch that light, but its fun flying after it and good exercise, too. Creeping along the narrow road toward Domme our big white bus was an unwanted obstacle to the train of tiny cars behind us. Most were packed to the gills with vacationing Europeans fleeing to the Dordogne valley’s famed rivers and hiking trails. The valley is a favorite holiday spot whose postcard perfect scenery is dotted by romantic medieval chateaus and Harry Potter-esque stone villages. Suddenly, we entered a forest. The sun disappeared behind the trees. The road turned into a long black serpent making frequent switchbacks. Our land yacht lurched and lunged, surfing the turns that took us from left to right and back again in less then 30 seconds. Side-to-side. Speeding up. Slowing down. Passengers sloshing in the rear of the bus began to complain of nausea and motion sickness. Of course, it was my fault. When I pointed the laser pointer at Domme on the map on the wall and said, “we’re going,” I had no idea that it would take so much effort or time to get there. This was turning into a guilt trip. Just then the bus swung into a parking area. Our seasick crew spilled out on dry land on shaky legs. “Oh look,” I said, pointing to the last three quarter mile of steep slope atop which sits Domme, “remember how good the long walk leading to the Great Pyramid felt? It won’t be that bad”. They looked at me like I had two heads. Fortunately, a local entrepreneur was waiting with his miniature railway train. Paying two euros each for the ride we climbed aboard the tiny train and chugged up the mountain like happy dwarfs with our knees in our chests. The conductor deposited us in the town square, a surprisingly lovely and colorful tourist trap with an astounding panoramic view of the heavenly Dordogne valley. My fellow travelers scattered into the shops in search of refreshment. I bolted for the tiny Templar museum sandwiched in between two handsome gift shops to inquire about the Templar graffiti. Inside I was sorely disappointed. The Templar prison was closed! Seeing my smile melt into disappointment the sophisticated young French woman behind the counter flipped a look to the wall behind me. There sat a stone replica of the Templar graffiti. “That’s as close as you’ll get, Simon Templar,” her look seemed to say as I smiled back at her in appreciation. I fired off a few shots with my digital camera. Then I settled in for a long gaze. It was nothing like I had imagined. The drawing was crude. But what should we expect from prisoners drawing on rock? Sure enough, there was a crudely drawn figure of a person (is it a he or she?) holding a rod that looked like a downward pointing arrow (or the Spear of Longinus?) to me. Beside the figure is a spread eagle Jesus on a cross. This surprised me in its similarity to early fifth century Christian depictions that show a muscular, almost superhuman, Jesus spread out against the cross; so different from the giant crosses with a small (or often no) Jesus Christians display in America today. Why, I wondered, would Templars carve crucifixes on the wall of their prison at all? Denial of the crucifixion, or a Savior who hangs on a wooden cross, was the requirement of initiation into their order. To get in they spit on the cross. The reason for this remains a closely guarded secret. The Templar denial of the crucifixion is similar to that of the Cathars (who were first terrorized then systematically slaughtered by the Church only 60 years before) and their rejection of the cross as a symbol because it was an instrument of torture, a false idol of terrorists. The only source that Christ (‘anointed’) means “crucified”, claimed the Templars, is the belief and the doctrine of the Church. The Templars rejected this belief. Was this drawing some form of allusion to the secret Rule of the Order, a reminder of their oath? Did they ritualistically spit on it while imprisoned, perhaps to gain resolve? Remember, Jesus used spit on some healings. Did the Templars know his ‘healing spit’ secret? 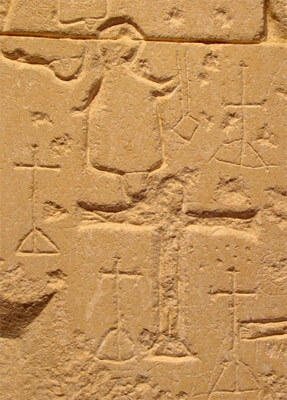 Additional out of place details in the Templar graffiti included seven pierced pyramids topped by tall crosses. Another non-Templar symbol is a fish and a Tree of Life and another larger creature or object topped by a cross, which we’ll discuss momentarily. When French king Philip the Fair ordered the arrest of the Knights Templar in 1307, the Order of the Templars was one of the most powerful forces in the world. Supposedly formed to protect pilgrims from the “infidels,” most agree that during their travels throughout the Middle East during the early 12th century the Knights Templar were clandestinely in pursuit of ancient knowledge. It’s claimed these militaristic monks reclaimed the secrets hidden beneath Solomon’s Temple atop Jerusalem’s Mount Moriah and subsequently acquired enormous wealth and knowledge… perhaps beyond earthly riches. What could be more valuable than gold or other treasure? Whatever it was it posed a challenge to the temporal power of the king of France and to his supporter the Roman Catholic Church. For a clue to this metaphysical treasure we return to the image of the fish and the tree beside the cross at Domme. They are easily comparable to the Sephirotic Tree of Life (see diagram). The Sephiroth are the ten qualities of the Mystical Tree, set forth as a major doctrine of the cabalistic Book of Splendor (The Zohar), which was first published about A.D. 1280 although its legend claimed a much earlier date. Mastery of the principles of this enormously powerful spiritual tool allows the manifestation of the Divine into the world and the means by which Divine Union may be achieved. The Zohar compares itself to the Ark that gives shelter. If we understand their graffiti correctly its symbolism suggests the Templars imprisoned at Domme had acquired esoteric knowledge. The only way to reconcile the appearance of the crucifix and the Kabbalistic Tree at Domme is to recognize that far from denying Jesus, like the Cathars, the Templars worshipped him as an angel of light who had entered human affairs to deliver a spiritual technology for escaping earth life and to cross into the Kingdom of Light via the Tree of Life. The Gnostics frequently called Jesus the Tree of Life and a branch. At Domme, we have a figure holding what may be Jesus’ wand. Is it a branch from the Tree of Life? As noted, the Templars did not confuse Jesus, the man of light, with Christ = the timeless quantum cosmic essence that exists everywhere and nowhere. Instead, they accumulated technology (a cluster of principles including alchemy, sacred geometry and astronomy) that once belonged to this enlightened person and his apostles and enabled the manifestation of Christ. This ‘Christ technology’ could ‘feed’ us, transmute an individual into a higher being and even create an advanced social order, a new Kingdom of Heaven on Earth. Philip the Fair and the Church of Rome wanted this technology for their own purposes. Helter skelter. They planned to crush it out of the Templars like a bunch of grapes. 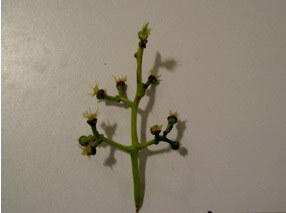 A fish with a Tree of Life (top) whose branches resemble grape stems (below). The Sephirothic tree overlaid on the Templar tree. A perfect match? Cabalists call all ten Sephiroth collectively the Merkabah or “chariot” of God, whereby the Divine could descend from heaven into men’s souls. Beside the fish and Tree of Life at Domme is another larger ‘fish creature’(?). Obviously any one can read anything they want into this symbolism. To me, this fish creature bears an amazing resemblance to a drawing presented by Robert Temple in The Sirius Mystery of the descent of Nommo, the amphibious savior being the Dogon tribe of Mali believed had been sent from Sirius to watch and educate humankind. 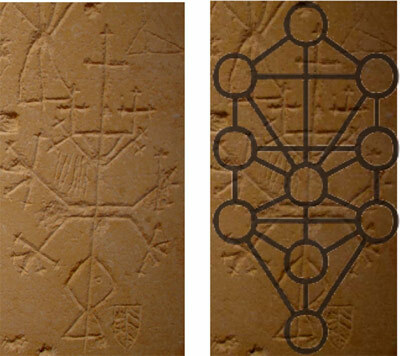 Is Nommo’s craft the Merkabah chariot? Nommo divided his body to feed humankind. His name is thought to mean, “make one drink.” Nommo was known as masters of waters. Interestingly, the Merovingians, the alleged ‘offspring’ of Jesus and Mary Magdalene who ruled this part of France, claimed descent from a fish creature that came out of the ocean. This fish-being is widely traced to Oannes in Babylonia and Enki in Sumeria. Both are equated with Nommo…and Jesus. Enki is portrayed in the Babylonian seal shown here. He hovers in a winged ring or craft (an ark?) above a utensil operated by priests wearing fish suits. It appears to portray Enki descending in a Merkaba chariot. This is a purification ceremony. 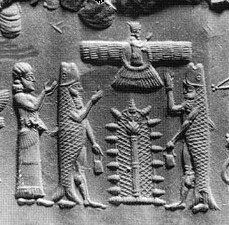 Priests of the fish god Enki or E.A. tend a radiant pillar surmounted by a winged ring ridden by E.A. 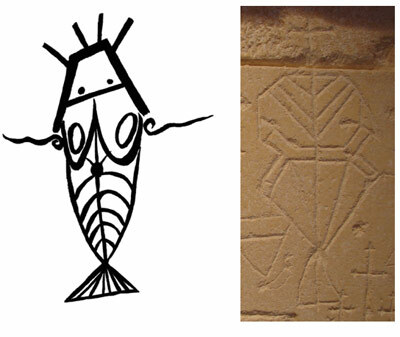 In the catacombs of Rome we also find the identical theme in an astonishing Early Christian fish glyph. 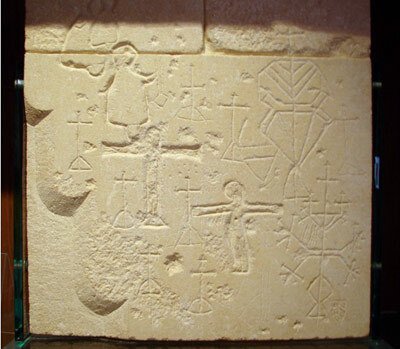 The Early Christian symbol of the anchor with a cross with a pierced circle and a fish grasping a line of hope or salvation is plainly kin to, if not a copy of, the Sumerian seal portraying the fish priests beside a radiant tree or pillar above which hovers Enki. 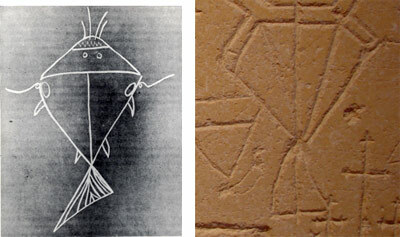 Both are identical in meaning to fish grasping the Tree of Life in the Templar engraving. The match between these emblems – all three portray fish attached to a tree (or tower?) topped by a symbol for the Lord – leads to a profound question. Were the Early Christians devotees of Enki/Nommo? Were the Templars, as well? The fish at Domme may be the key that unlocks this engraving. In ancient Christian symbolism the fish stands for the concept of the living water referenced in so many traditions. This living water is different from ordinary water. It’s cosmic. It has a quickening effect. As Ezekiel 47:8-10 tells us its source is the Temple of Solomon in Jerusalem. The ‘fountain of living waters’ is mentioned in the Old Testament’s Song of Solomon (4:15) The living waters flow from the Temple. What is it about Solomon’s Temple that produces the living water? And what does it have to do with the Templar excavations there and the graffiti portraying a Tree of Life/ fount of living water? I’m not certain, but this living waters connection is made even more relevant when we acknowledge that in French literary tradition introduced in the 12-13th century Mary Magdalene is remembered as la Dompna del Aquae: Mistress of the Waters. Is it she holding a branch of the Tree of Life at Domme? Or, could it be a beaker holding living water? Like the Medieval Cabalists the Templars who engraved these drawings crammed a tremendous amount of information into a very small space. Whatever it means this astonishing conglomeration of religious and philosophical symbolism, which taps into the root and runs into the branches of religious beliefs of the ancient Middle East, certainly suggests the Templar prisoners at Domme were aware of mystic traditions. William Henry is the author of The Illuminator: Mary Magdalene. Solomon’s Key. The Lost Secret of the Templars. Thanks Wm Henry , I dream of eventually taking one of your tours ! Good luck and God bless you . Very fascinating. Thanks for sharing.